On a morning commuter train in New Zealand's capital city, Wellington, the lives of three people briefly intersect. Sally is a 17-year-old, tentatively stepping into womanhood. Brendan is a middle-aged widower, living in the shadow of his wife's death. Tamas is a Hungarian immigrant, missing his wife and child as he struggles to begin a new life far from home. 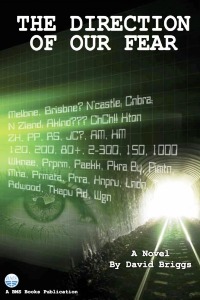 Meanwhile, in a nondescript building near Dunedin's Otago University, Farida translates messages for the security services and catches glimpses of a plot that could threaten them all. What a great book! THE DIRECTION OF OUR FEAR looks at the many many small decisions we make every day that result in benefit or harm, to ourselves or to others. Sometimes small harms and slights, sometimes catastrophic. It deals with the networks we are a part of; those we know of and those we don’t – and the many alternative universes that shimmer before they collapse down to the one that we experience. It is a tense and absorbing story of four people. Three – Brendan an Irish widower, Sally a young school girl, and Tamás a Hungarian immigrant – are all connected by travelling on the morning commuter train to Wellington each day. The fourth protagonist is Farida, a young Muslim woman working as a translator for the security services in Dunedin. We follow all of them and learn of their dreams, their regrets, and their opportunities. They are all dealing with possible changes to their lives – Brendan thinking of starting a new relationship, Sally crossing into adulthood, Tamás trying to make a place in New Zealand for himself and his Hungary-based family, and Farida trying to make sense of her own world and that which she glimpses via her security work, and struggling with what to do when she thinks the two might be overlapping. And we read of all of this within the frame of terrorist threats. A sense of pending tragedy looms as you read of Brendan, Sally, Tamás and Farida – ordinary people whose lives may or may not soon be engulfed in disaster. Highly recommended.